I missed out on three of the Winter Training Series rides since the last one I did, but made it to Number Six last weekend. I can only make it to the rides that I can ride to, or conveniently take public transit and for this years WTS quite a few of the rides do not fall within that criteria. That included this one, but when I mentioned that to some friends they suggested I use their car while they were in Europe. I took them up on this offer and on a cloudy Saturday morning found myself driving to Kent. 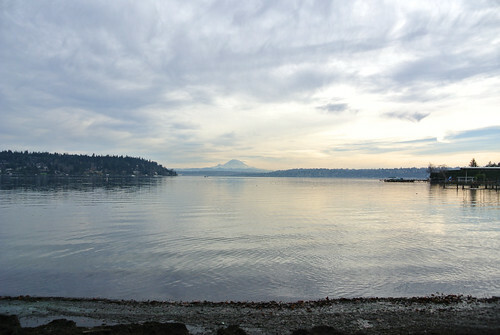 It was predicted to be overcast in the AM and cloudy in the afternoon but as I drove out there, Mount Rainier peeked out beneath the clouds. It is in it’s great late winter cloak, all soft and white with fresh snow. 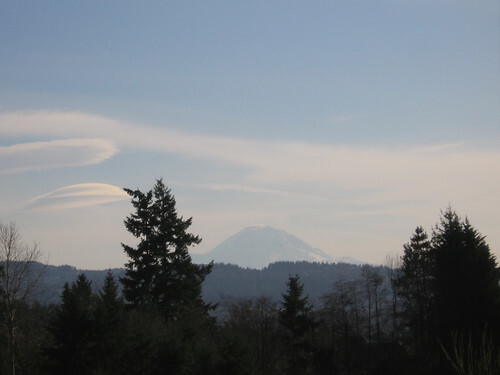 It was obscured but the cloud by the time I reached the starting point at the Soos Creek trailhead so I never was able to capture a photograph. It was recommended that you park at a school about a half mile away as the trailhead had only a tiny parking lot. 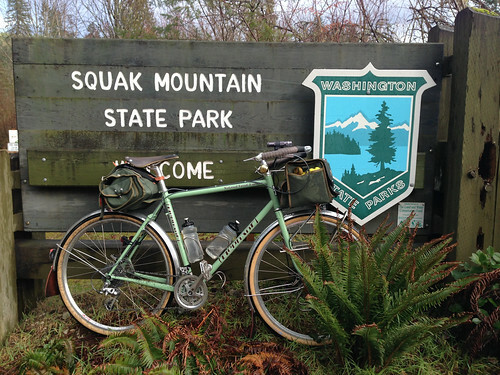 I did so and rode down to the trailhead where there turned out to be plenty of parking. 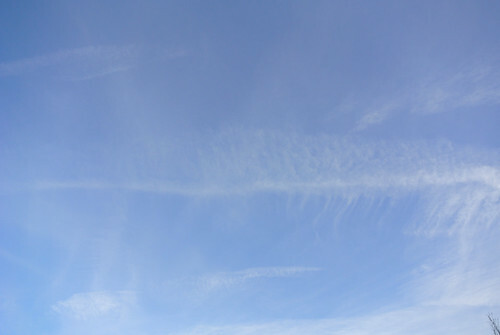 There was probably fifteen or so people there, all bedecked out in their Showers Pass Jackets. As per the last time it was a mix of the Rando and Roadie crowd. I’d arrived just a few minutes before the roll out so I checked in, used the facilities returning as the ride leader was giving the route overview. Minutes later we left right at 9:01. The route wended it’s way through suburban Kent, working it’s way over I-5 and then to the coast just below Des Moines. Once again not being much of a group rider I kept toward the back. After a couple of unfortunate red lights I’d lost sight of most of the group. Of course since I use these rides as motivation to get out early and do a pre-planned route I don’t tend to worry much about. Also stopping to take photos doesn’t help you keep up with the never-leave-the-saddle crowd. 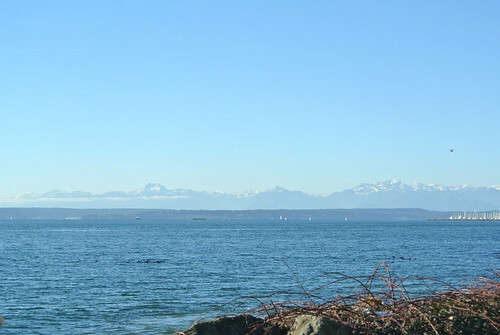 So it pretty quickly was a solo ride for me and I was really pleased to do this one as it pretty much continued on with a route I’ve followed a few times from West Seattle to Des Moines. 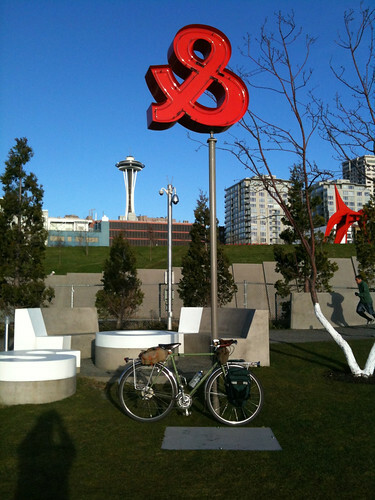 That route I always figured continued to follow the coast to Dash Point and then turned eastward to cross the I-5 and hook up with the Green River Trail to SoDo. Well this route more or less interested that route just a bit south of where I’ve ended it. And indeed the Dan Henry’s were on the ground and we often were following that route. So this route had a bunch of new territory for me which is always a major selling point. 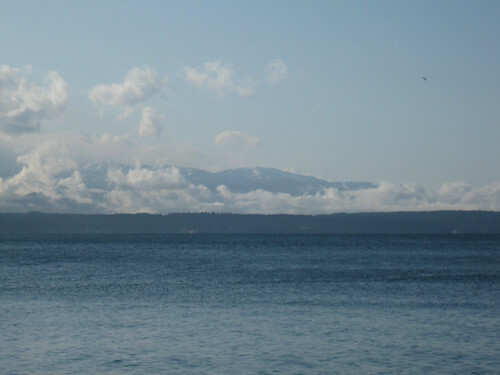 Once we hit the coast of the Puget Sound it was a screaming descent down winding roads to Redondo Beach. Here I began stopping to take more photographs thus insuring I’d never catch up with the group. I’d last seem them a ways ahead of me just before this descent. I also passed a roadie changing a tire, but he didn’t require any assistance so I rode on. 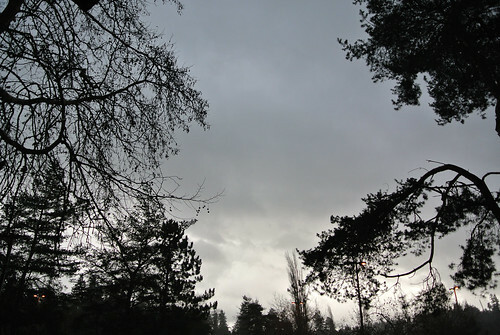 It was pretty much all clouded up now and one could see darker rain clouds rolling in from the south. The route hugged the coast and there was several really stiff climbs followed by curvy descents. Great riding. I took a slight detour off the route, caused by a rather unclear direction, but it actually was a better choice as it stayed on the coast and intersected the busy road that the route used a bit further on. This busy road took me to Dash Point and while it was pretty trafficked there was a terrific section that was all winding and mostly down hill. 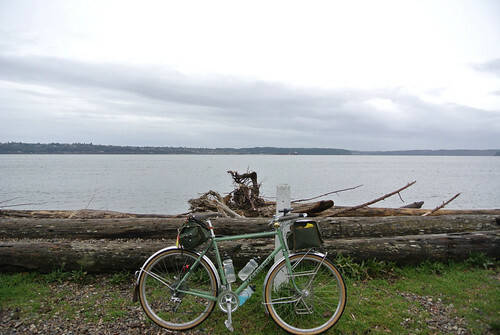 Back in the woods, with peekaboo views of the coast I passed Dash Point State Park. I stopped for a photo and while I did so the roadie who’d had the flat passed me by. Taking my time! 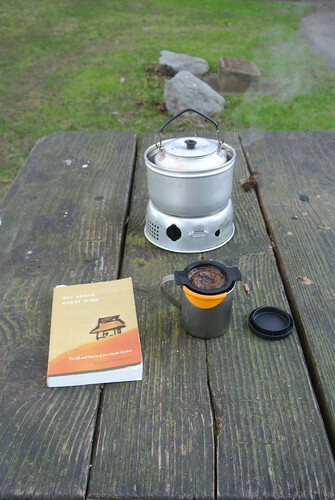 Anyway I didn’t really check out the State Park but noted it had camping – I’ll have to do an overnighter here sometime. 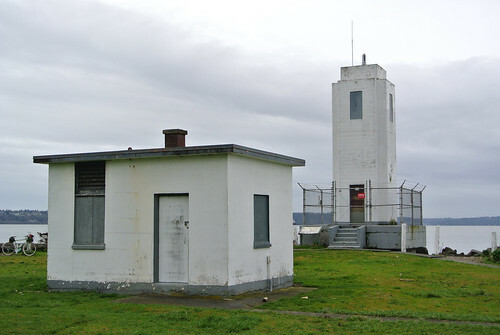 From Dash Point it was more ups and downs to Browns Point where I again had to leave the route to check out the Browns Point Lighthouse. 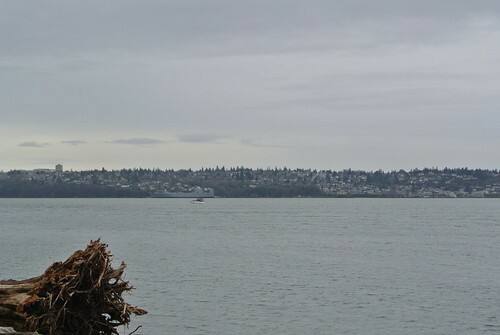 Browns Point is in Tacoma, the first time I’ve ridden into that city (though only on the margins here). 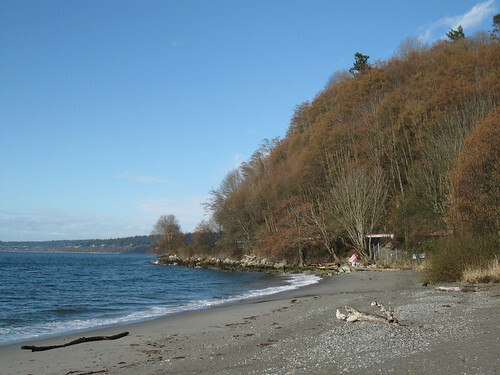 However at this point the route climbed up from this coast and turned eastward into Federal Way. 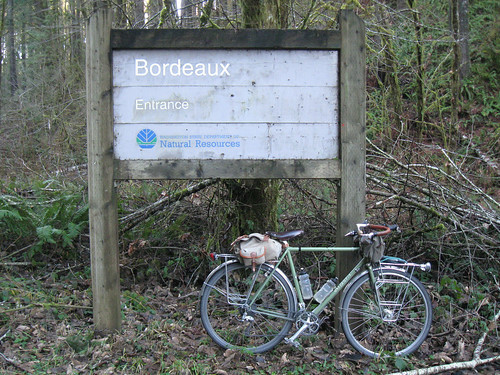 The highlight here was riding on the BPA Trail which I hadn’t been on before. This was no flat rail trail; no it is a power line trail that cut due east following whatever the terrain did. 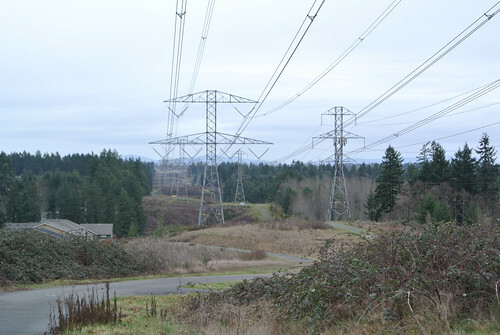 Unlike most power line trails it was fully paved, though there were lots of dirt and gravel “cut-offs” throughout. At the end of the trail it was just a little bit though edge city until I made my way under I-5. 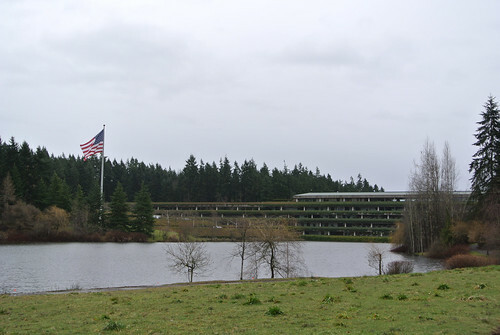 Here I was right by the old Weyerhaeuser Headquarters which is a famously green building (even if the company isn’t) and is another place I’ve seen only from the road and have long been curious about. It had began to drizzle around the time I exited the BPA trail and at this point was a fairly steady rain. Pretty good gusts of wind from the Southeast too as that flag demonstrates. 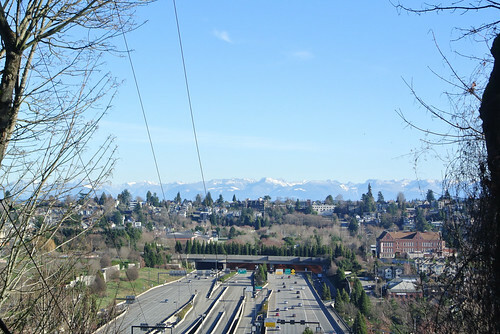 After working my way around the Weyerhaeuser campus and there was some bits through far exurbia and then a long descent back down to the Rainier Valley and shortly into Auburn. 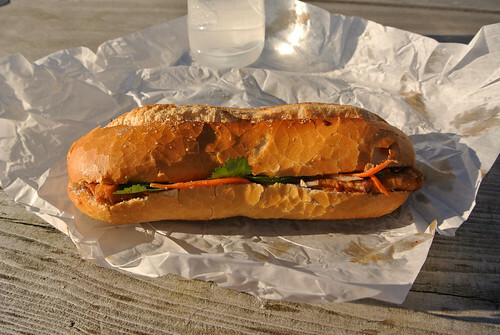 I stopped at the Auburn transit center and ate some lunch that I had brought with me. Now I was back into rather familiar territory. 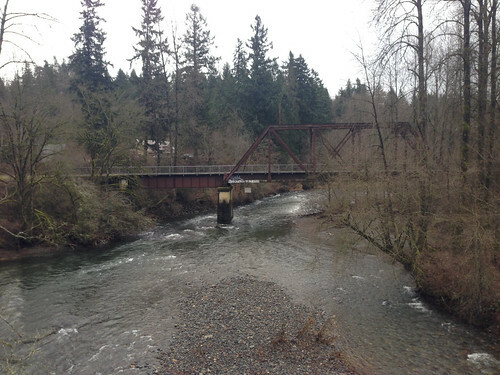 The Interurban (South) trail runs through Auburn and you turn off here for many rides in Southeast King County. WTS #6 followed the route to Flaming Geyser State Park which I’ve ridden to two or three times. The bulk of this time is spent on Green Valley Road and it was steady rain and wind that whole time. Out here in the valleys and foothills there is a lot of signs of spring’s imminent arrival. 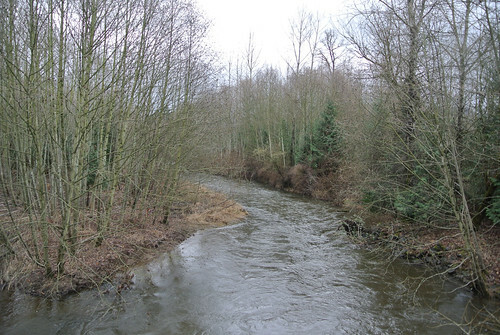 The Green River (and later Soos Creek) was swollen and pushing outside it’s banks, there was standing water in many a farmers fields. Today’s rain wasn’t slowing that process down. Exiting the Green River valley involves some quality climbing, the last real climbing of this ride. Once I finally crested the valley walls it was a pretty short stint to Black Diamond where I stopped at the bakery. I ingested some calories, changed to a dry pair of socks and pretty shortly continued on my way. From Black Diamond it pretty much is all down hill / rolling hills to Kent. This was mostly on the Kent-Black Diamond road, which has a good should but is pretty busy. But it was fast riding, though again raining the while time. 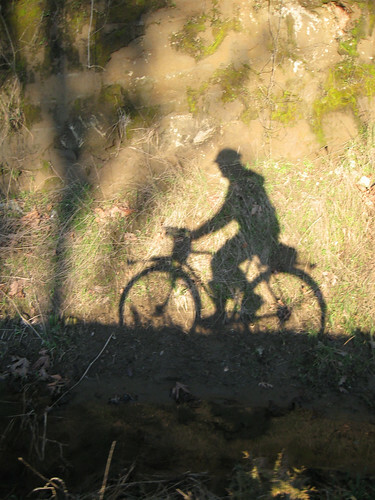 Finally I popped onto the Soos Creek Trail which I rode back to the trailhead where it all started. Another first time on a trail for me, this one is a real gem. In wooded green space the whole route, with the (flooding) Soos Creek and wetlands among the trees and fields it went through. 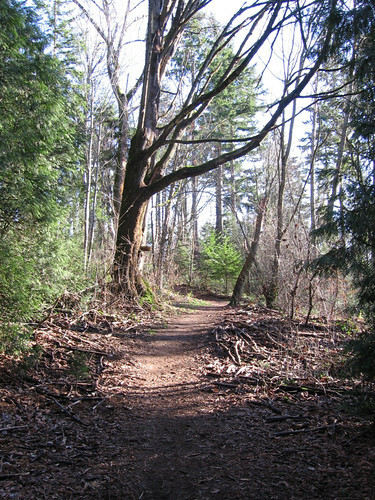 Not a really long trail but a great one. Still I was happy to reach the end and ride the short distance to where I was parked. All my photos from this ride are here: WTS #6 Album. 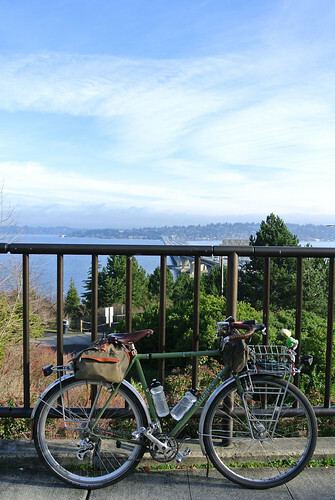 Saturday January 16th I left my place on Beacon Hill a bit after 8am and rode across Mercer Island and south on Lake Washington to Newcastle Beach Park. 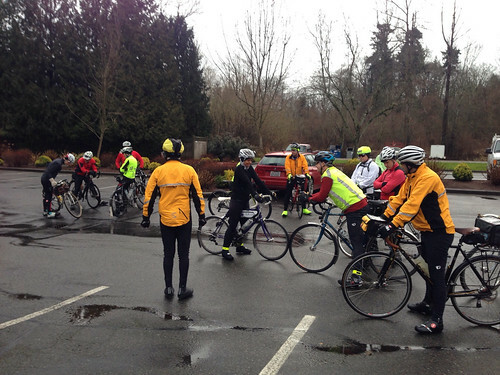 I was meeting an ad hoc group of SIR and CBC members engaged in the second of six Winter Training Rides. Most of these rides are a bit too far away for me to ride to, thus I’m only dipping into the series. I wasn’t able to do last weeks ride (though ironically due to ice it was shifted to noon which I could have easily made, but by then other plans had been made). When I got up this morning it was pouring rain, but I was committed and pressed on with my morning routine. But the time I left my apt it was just a heavy mist. 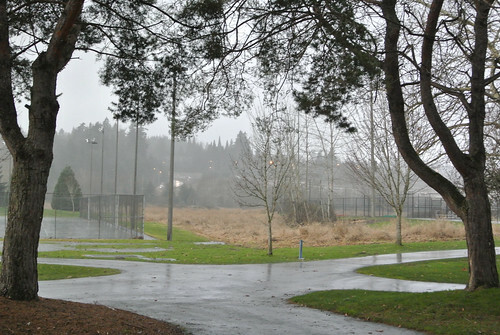 It was mist and very light drizzle all the way to Newcastle Beach Park. I arrived about fifteen minutes before roll out – just about right. I’d registered online, so they just had to check my name off a list. The drizzle increased a bit at this point. 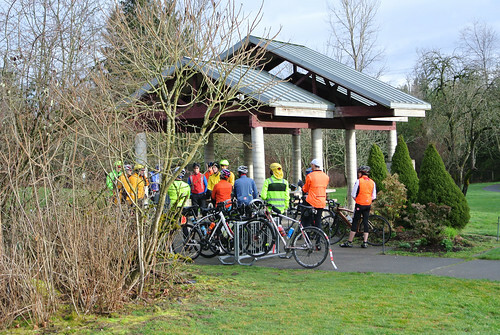 There was maybe sixteen riders or so a mix of rando’s and club riders predominately wearing Showers Pass jackets. We rolled out right at nine and as we climbed out of the park a couple of riders were coming down the hill. They simple swung around and joined the pack. I rather pushed myself to get to the park before the start of the ride, so I tried to pace myself for this ride. Thus I pretty quickly fell toward the back of the pack, riding in the back quarter for most of the early part of the ride. When I’d first glanced at the route (see above) I felt that it was mostly on roads that I was familiar with. Well while I was familiar with most of the regions we were riding in, I was familiar with probably only half or two-thirds or so of the roads. 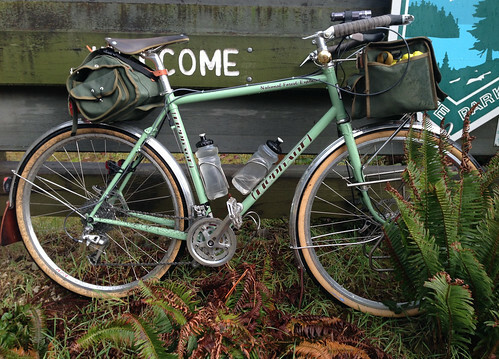 So within fifty miles of Seattle there was a lot of new riding! 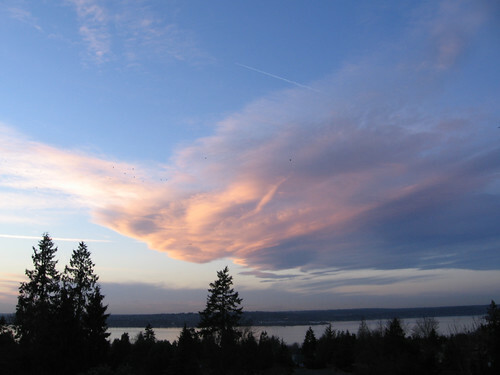 It began on the Lake Washington Loop but at Renton it forewent the typical route through town to the Cedar River Trail and instead cut through the east side of town and up to the Renton Hills. This stiff climb separated out some of those riders for whom the WTS was their first ride of the winter. Not being in great riding shape myself at this point at least my bicycle is geared for these hills. 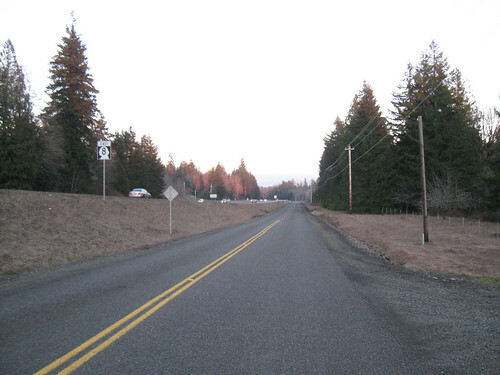 I’d fallen behind the pack due to hitting a series of red lights in Renton – I was riding with just one other rider on a Disc Trucker – but now I was back in the back third of the pack. We entered a park and at the end of the park there was a really unclear jog on the map and I ended up going the wrong way. I figured this out after about a km and climbed back up the hill and was back on track. But I would never catch up to the main pack again. The route now descended down to the valley and I crossed 109 and onto the Cedar River Trail for just a couple of kms. 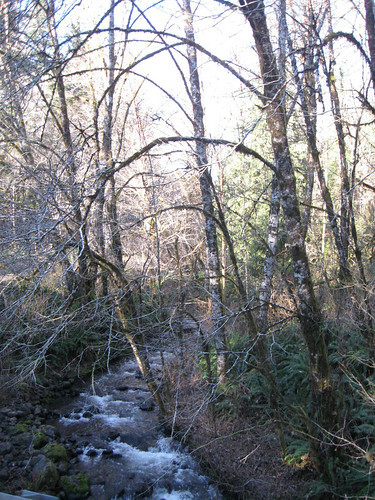 Then left the trail, crossed the Cedar River and followed the excellent Jone Rd along the river for a spell. 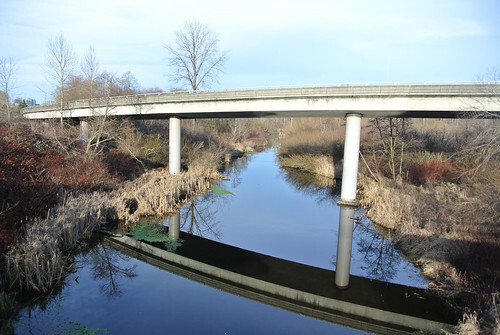 This was great country riding, not to far from the Renton-Maple Valley freeway, but with the Cedar River between you and the highway you could barely sense it. Steep, wooded valley walls to the north and the little farms and the river to the south. The route wound around the river with ups and downs and was just nice riding. I crossed the highway again and then the route climbed the southern valley walls. This was a good stiff climb and part the way up I encountered another rider checking his cell phone. He said he though he was the back of the back and I said I’d taken a wrong turn. He asked if we were supposed to turn at the next road and I replied that it looked like we were on this road for a while. I continued up this hill for a while and it was a tough climb and I was feeling my lack of riding. At the top I had to stop and eat an apple I’d brought. The roadie continued on, but not long after I set out again I encountered him again checking his phone. He said he just was unsure where we were. So he followed me for a while occasionally pulling ahead and then double checking his phone. Finally we entered Covington and he said “Now I know where we are. I’m back on track again, thanks to you” and he took off. 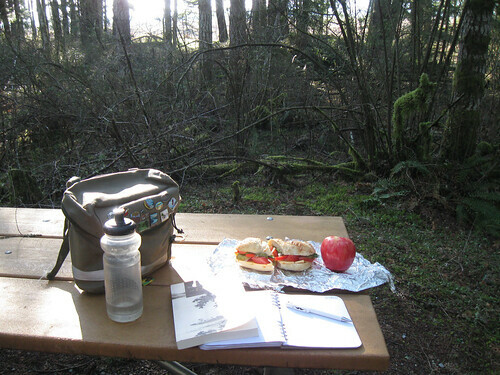 I stopped at the AM/PM to refill my water bottles and to eat some lunch I’d brought. After this stop for lunch I knew I was pretty much never going to catch back up to the pack, so I pretty much switched into solo riding mode. 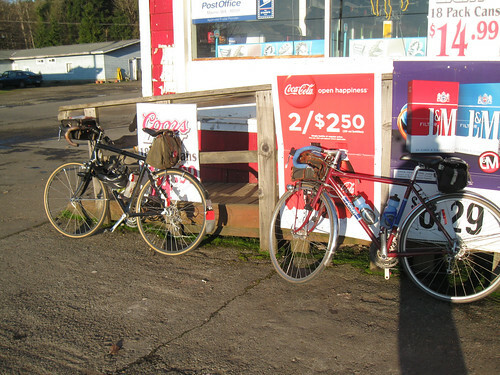 The route skirted the rest of Covington and then climbed up to a plateau. 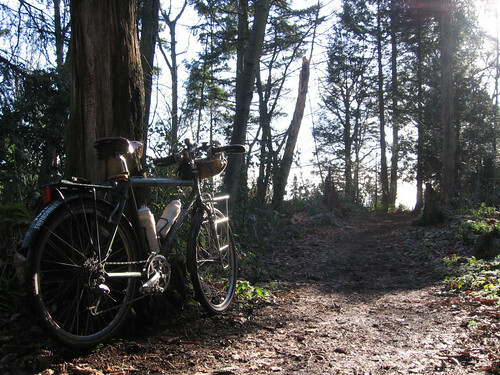 The riding was in that kind of forested exurban neighborhoods you find around here. Fairly busy roads, a decent amount of houses, most of them with pretty big yards. Not much density. 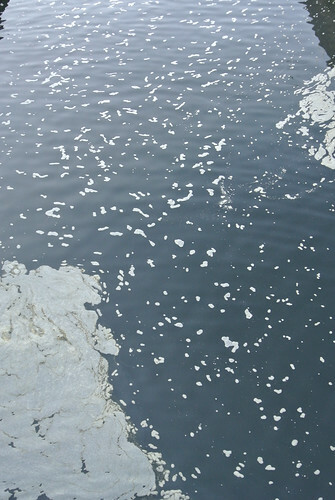 I was on a pretty busy arterial when I heard that sound you hear when a pebble shoots out from your tired. But it sounded more like a puncture. A couple of blocks further on it was clear it was a puncture. Well that’s the price of these lightweight, “supple” tires. I pulled over and made the change. I have to say their is definitely an advantage in disc brakes for the tire change. I had some trouble with this new small pump I’d brought but hadn’t really used. Eventually though everything was back and I was about ready to head off. At that point a rider stopped checking on me and he, and two others, turned out to be later joiners to the ride. They rode on and I never saw them again either. Not much further on from the tire change the route descended into Maple Valley and was in territory I was familiar with, but on a different route. It crossed the Green To Cedar Rivers trail, a soft surface trail that connects to the Cedar River Trail that I’ve ridden on a few times and then ran on back roads to the actual junction of those two trails. It was kind of neat to be on this side road I’ve seen many times from the Cedar River Trail. 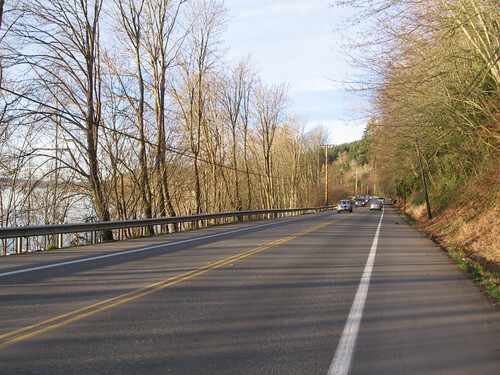 Eventually though the road joined up with the Renton-Maple Valley highway and ran on it for a short time. I missed a turn that was almost immediately off the highway so I rode on it a little further and took the next exit and doubled back a bit. It began to rain at this point. I was now on very familiar roads as this is a route I’ve done many times connected Issaquah to the Cedar River trail. It climbs up over the valley wall and then onto high farmland. You take the Issaquah-Hobart road the bulk of the way. This road is pretty busy as drivers have figured out this nice back way between Renton and Issaquah but it makes for okay riding. Hobart literally has one store and a church and is about the most quintessential small country town around. Before reaching Issaquah the route turned west on May Valley Road. This is another great riding road that alas is a bit overly trafficked. I tend to enjoy it more coming west to east (and in the summer!) 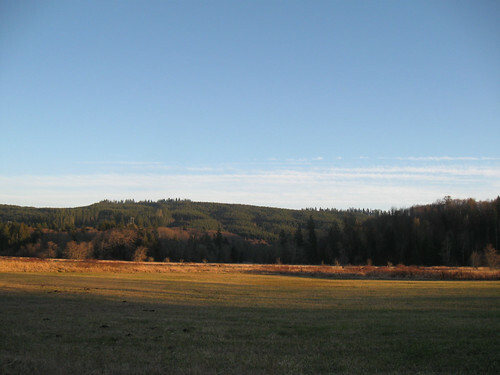 which is a bit more downhill, but more because you are on the open side of the valley which is all fields and farmland. 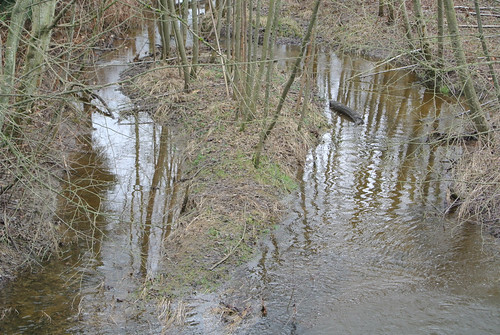 These lowlands were all quite flooded on this day and in the now pretty strong rain it wasn’t abetted. As I made my way up May Valley, the rain which had been pretty heavy for the last hour or so petered out and there was even some gaps of blue and bright sun. 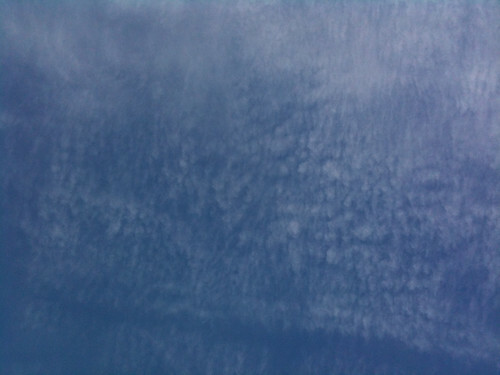 There would be a pattern of sun, clouds and rain for the rest of the ride. I pulled over a Squak Mountain State Park for a short break and to use the facilities but from there it was pretty much a straight shot home. My left knee was hurting a bit and I wasn’t sure if it was just being out of shape, or that the still relatively new NFE was precisely adjusted or an old injury to it flaring up. Probably all three. The pain would come and go but made this last stage a bit unpleasant. There was one last new bit of riding for me and that was into the Newcastle Hills. 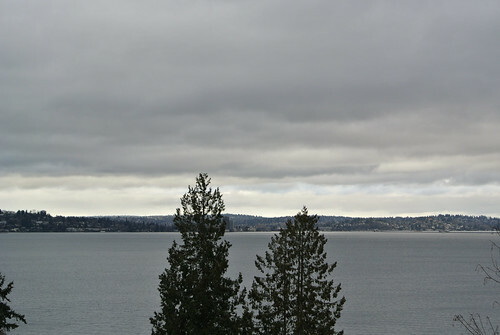 The route seemed to inexplicably turn off the standard way back to Lake Washington and up a super steep hill right into a gated community. 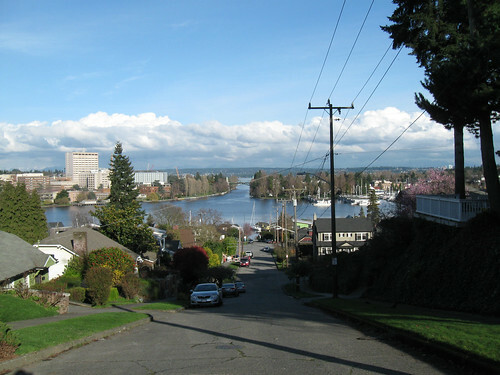 But once up that hill the route wended it’s way through suburbia eventually onto a narrow one way road that skirted a greenspace and then joined Lake Washington Blvd. 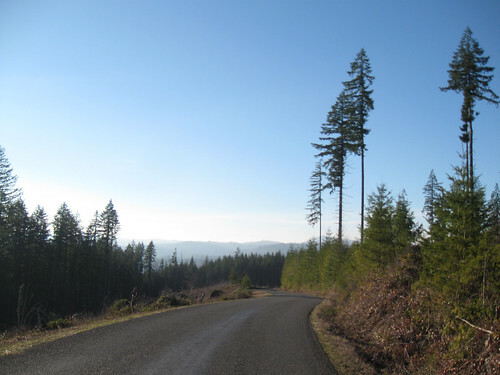 A very clever backroad route back to the Lake WA. Loop! I didn’t bother riding back down into Newcastle Beach Park, certain that the ride was long done. 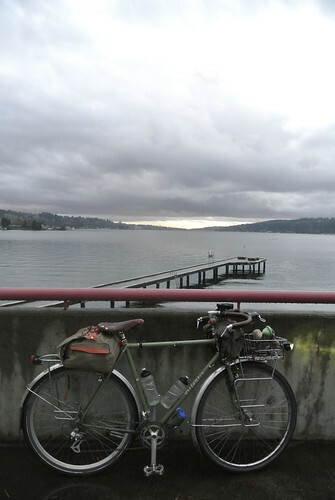 I continued on and backtracked my route there: Lake Washington Loop, I-90 Trail, cross Mercer Island, Mountain to Sound trail then the Beacon Hill Greenway back home. I made it back a bit after 4pm in dwindling light. 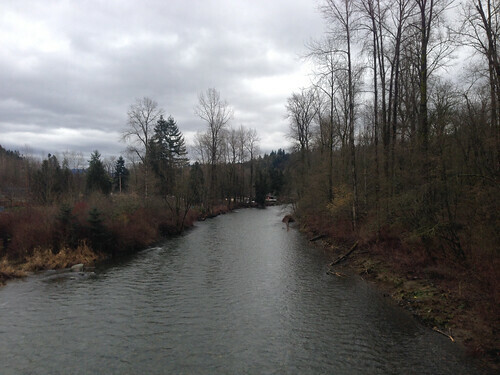 A few pictures from this ride (iPhone pics alas) can be found in my WTS #2 album on flickr. 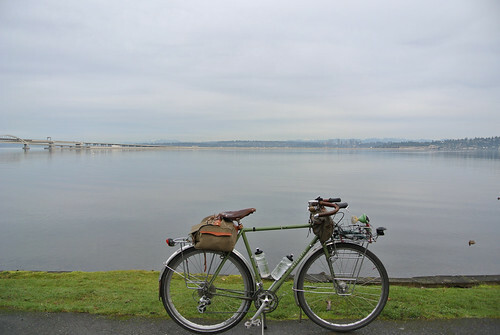 I’ve been living in Seattle for about nine months now (and of course just across Lake Washington for 12+ years) and am going to at the end of this month set out on an extended bicycle tour. I’ve moved in at the tail end of summer and was here for all of autumn and winter and about half of this spring. During this time I’ve ridden (and walked and bussed) all over the city for recreation, for utilitarian purposes and for transportation. I broke my camera on one of these rides so a lot of them went undocumented, but I got a new (used) camera for my birthday and was back to taking photos. 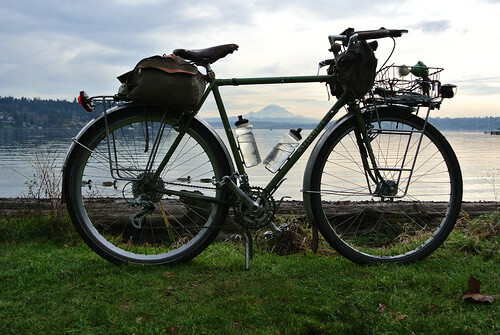 So this post is the first of at least a couple with rides around Seattle. 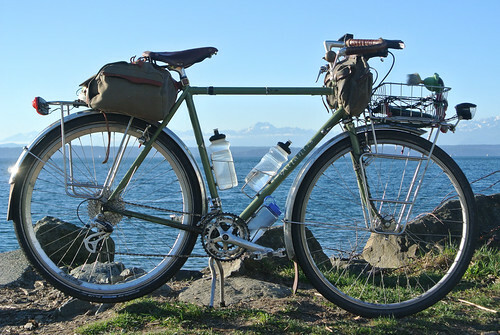 These posts will mainly be in the form of photo essays with pictures of sights and scenes witnessed while out riding as opposed to routes or individual rides. This post will focus of rides taken in the winter, mostly late February and March as that is when I got my replacement camera. Some of my more regular rides took place mostly in the dark what with it being winter and all, so this is by no means total documentation of all my rides. 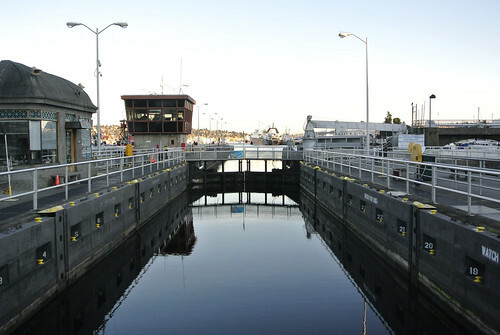 Prior to moving to Seattle I think I’d ridden through the Ballard Locks only once or twice, but it has since become a regular part of several rides. 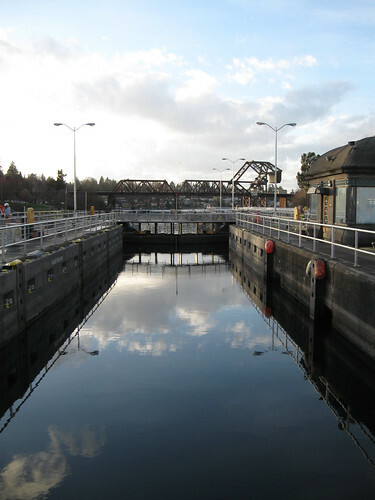 On a warm summer day it can be packed at the locks and walking your bicycle along the thronged walkways a real trial. 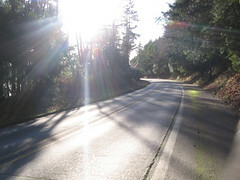 But in winter, even on a clear day, it is a nice route. 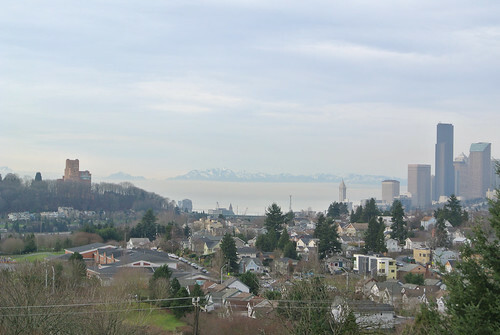 One of my more frequent rides was to ride up Capitol from the U-District heading toward Beacon Hill. I did this the most in the Autumn and early winter often in the dark so never got any pictures of it. 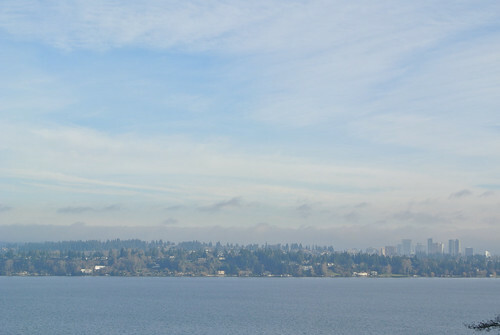 Riding up to Capitol Hill during daylight hours there are many beautiful views of Downtown and Lake Union on the west and the U-District and Lake Washington on the East. 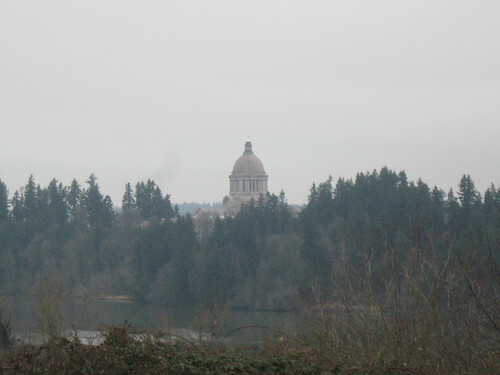 As per it’s name there is a good climb up to Capitol Hill no matter which direction you come from – it is a ridge between Lakes Union and Washington. Amusingly enough it is the heart of Seattle’s hipster culture so you often get to see those fixed gear bicycles pushed up the hills. It also has some of the worst pavement I’ve encountered in the City (which is rife with bad pavement) including on the bulk of the signed bicycle routes. Still lots of great riding, good exercise with all the hills and culture rich with parks, museums and endless amounts of restaurants, bars, coffee shops and the like. 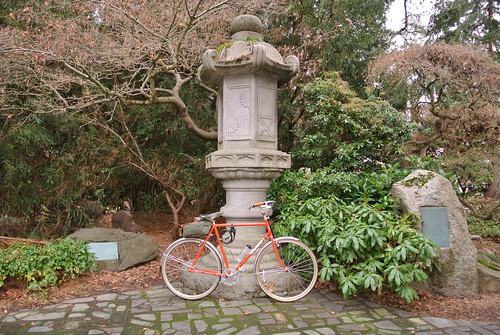 In order to get about anywhere in the city from the U-District you either ride up into Capitol Hill or west to Fremont/Ballard and various routes to downtown. 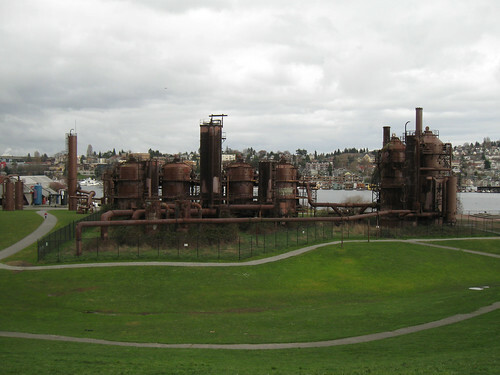 Along the Burke-Gilman Trail (a major rail-trail route) is Gasworks Park, which is built around the remains of a refinery. 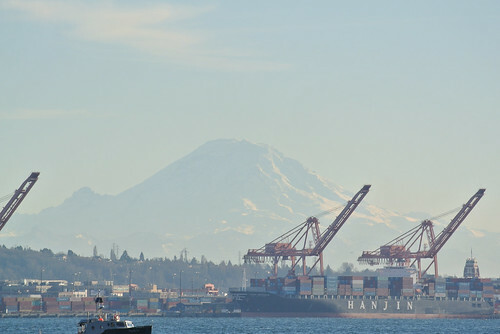 With it’s location, views of Seattle and Lake Union, lots of open space and of course the industrial age novelty this is always popular park. 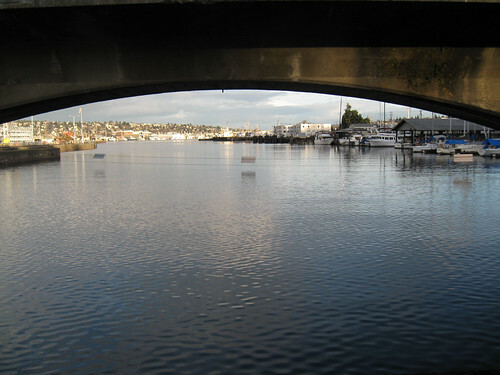 Lake Union which is surrounded by Seattle and the neighborhoods of Fremont, Eastlake, U-District, Wallingford and Ballard and looked down upon from Queen Anne and Capitol Hills is clearly a central features. 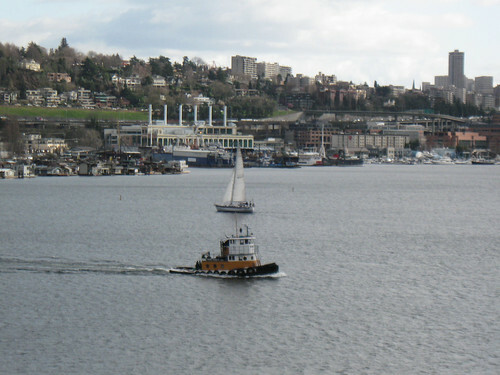 From water-skiers to house boats, sailors to rowers and of course the ubiquitous sea plane tours it is an active severely urban lake. 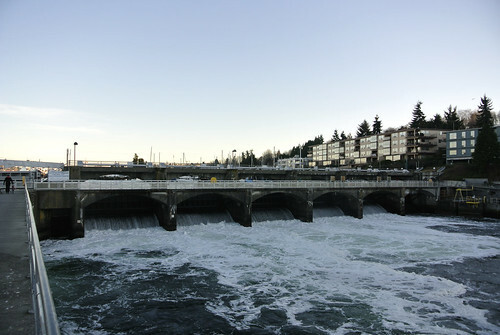 It connects to Lake Washington via the Montlake Cut and to the Puget Sound via the Ballard Locks. 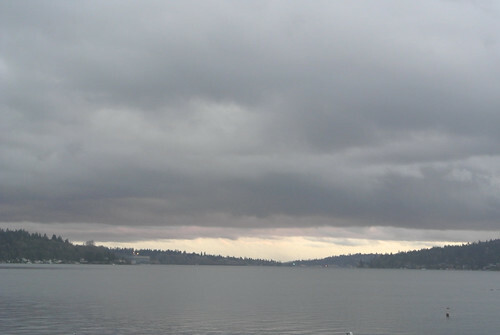 The sequence of the Puget Sound to Lake Washington is a major water thoroughfare. 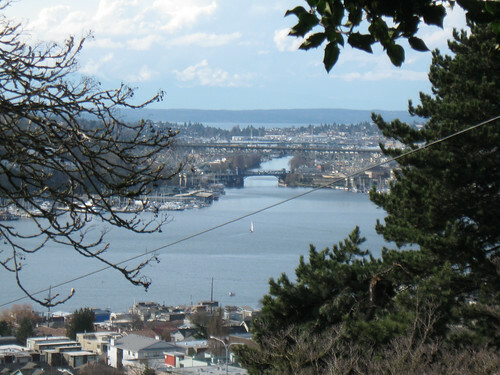 This whole water way is lined with parks and trails with the Burke-Gilman Trail being a corridor that stretches along it all. 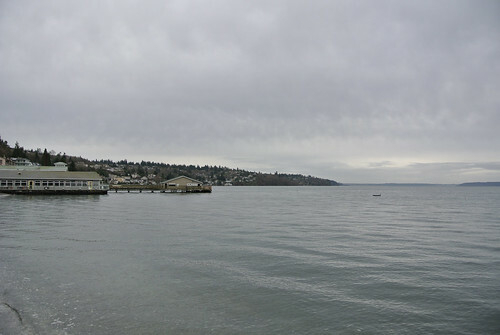 From it’s terminus at the northern end of Lake Washington (where it connects to the Sammamish River Trail which you can take all the way to Lake Sammamish in Redmond) it follows Lake Washington to the Fremont Cut, skirts around Lake Union to the Ballard Locks and via the infamous missing link, reaches Golden Gardens Park on the Puget Sound. 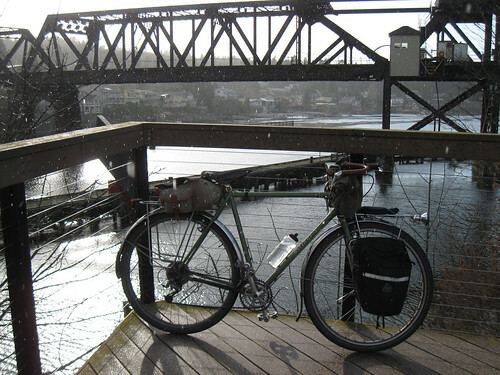 (check out this map for the whole route: Burke-Gilman Trail Map). 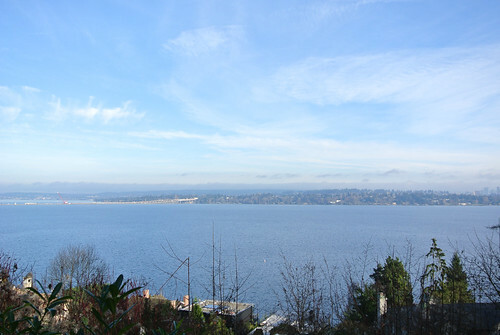 From Golden Gardens Park you can climb up a winding hill to the neighborhoods of Loyal Hights and Phinney Ridge. These are more residential neighborhoods mainly smaller houses but also the infrastructure to support that. 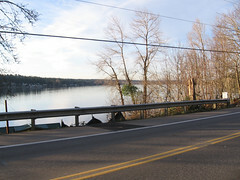 Continuing east you reach Greenlake where the lake and its parks are a major feature attracting many people. Further easy you reach I-5 which bisects Seattle, after going under it you are in Ravenna which is north of the U-District. All these neighborhoods are more residential with their small parks, open-spaces, shops and lots of little houses and apartment buildings. 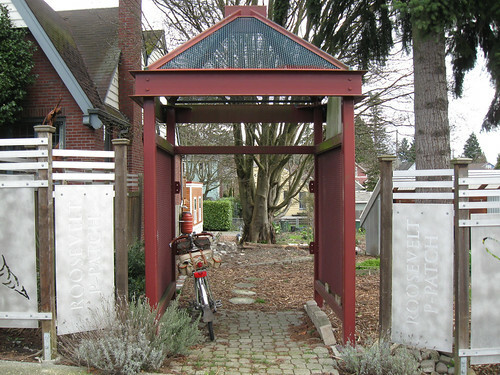 A totally different character than those areas that surround the water-ways or the dense younger demographics of Capitol Hill. 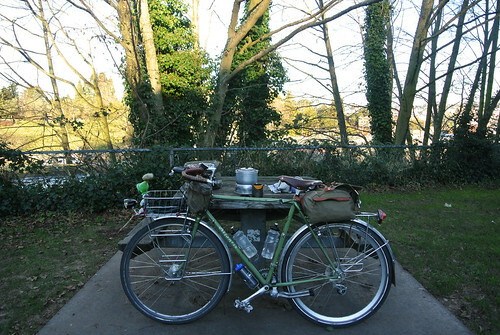 From Ravenna it’s a short mile or so south back to the U-District where I live and is a good place to wrap up this post. 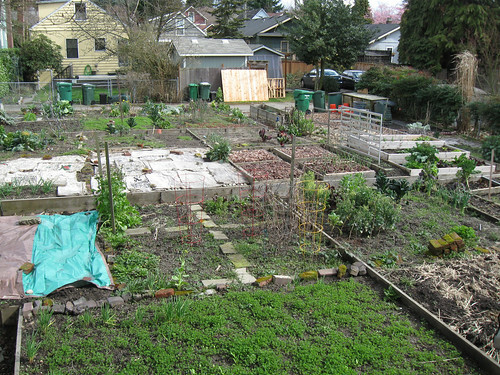 This only scratches the surface of Seattle and it’s neighborhoods, but this is just the first post in the series.